The Tide rolled in this week, and I couldn’t be happier with its reception. 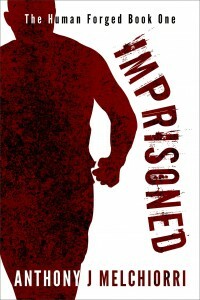 As of writing this, it has topped out at #1 in the Horror category on Amazon and #2 in Medical Thrillers. It was a blast to write, and I can’t wait to get the next book in the series out there. Currently, The Tide: Breakwater is set to release by December 28, 2015. 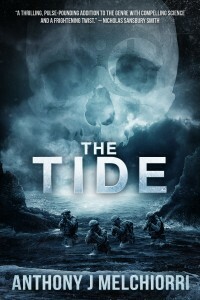 If all goes well, it may even be out earlier…Tide 3 is already in the works, too! It’s going to be a Skull-filled, apocalyptic season for my writing over the next couple of months. You can pick it up here on Amazon. If you haven’t read the book yet, this gives away some of the components of the nefarious Oni Agent featured in the book. You might’ve noticed in the book that Dr. Lauren Winters mentioned an NIH study on chelation treatment. That study, too, is real. Now the NIH study doesn’t mention nanobacterium per say, but I thought such a treatment might be useful for Skulls given the chelation treatment the NIH study examined was implied to have reduce the deleterious effects of calcified tissues in the cardiovascular system. Boom,we have our treatment for knocking out those nasty nanobacterium. Anyway, that’s just a small behind the scenes look at one of the scientific aspects of the book. I love doing this type of research and mixing in a bit of fact with fiction to give us a more believable zombie-esque monster. Hope you enjoyed it, too! Shukshin may be an ordinary truck driver, but his delivery route demands all the poise and determination of a ship’s captain in the vice-grip of a storm. He travels a highway buried in the depths of the Siberian taiga to bring vital supplies to towns before winter swallows the roads and makes them impassable. His task is one of dire necessity and certain peril, confronting the thorny side of both men and nature. Fortunately, Shukshin is not alone. In his copilot’s seat, Dusha, his faithful dog, joins Shukshin in his adventures through the taiga. But, when a blizzard rages through Siberia, Shukshin finds himself in a desperate scramble for survival. Even Dusha may not be able to save him from the grim dangers that lie in wait behind ice and darkness. Shipwrecked in Siberia is a 7,100 word, 29-page story of survival, following a man and his dog as they struggle, side by side, for a chance at life in the unforgiving ocean of the Siberian taiga. I have to thank all the early readers of this story who helped push me to make it better and to my editor, Emily Nemchick. I’m in love with the cover that James over at GoOnWrite.com designed for me. I feel that it portrays the ominous path that Shukshin follows and sets the scene for the story that takes place beyond that cover. 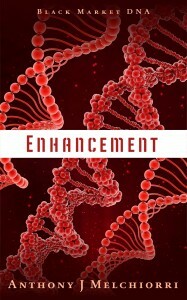 It’s been quite the learning curve just to push this first short story out and I can’t wait to get out my next novel tentatively titled Enhancement, the first book in a (well, hopefully) series called Black Market DNA. Man, it feels great to get this story out there for anyone to read, but I’ve got to get back to the writing and editing of the next couple of books so all you readers will really have something to sink your teeth into. If you get a chance to read Shipwrecked, please let me know your thoughts! I’d love to hear from you.